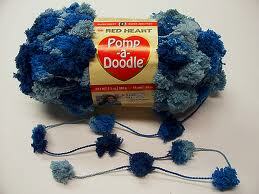 The pom-pom yarns (of which Pomp-a-doodle is but one) have limited applications for crochet. This stuff is pretty on the skein and looks like it would make a perfect Christmas tree garland all by itself. It’s soft and comes in attractive colors. But, what to do with it? Teresa at craftmania has created a nice edging using Pomp-a-Doodle. She’s got a tutorial here that will be useful if you like the looks of her hat and want to reproduce the results. It looks harmless wound up on a skein. But, once you see the actual yarn, you begin to imagine the difficulties you might have using it. Fear not. It’s not as hard as you might think. Teresa’s tutorial will help you make other items with this yarn too. Get it quick before it goes the way of all the eyelash and feather yarns of yesteryear. In the July/August Crochet today, they had two patterns using pom pom yarn. It was tricky to work with but fun! I did actually make a tree garland with it. 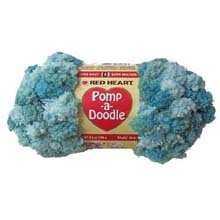 I used the Spark-A-Doodle version, which is identical to Pomp-A-Doodle but with sparkles. Crocheted up like lightning, and everybody loved it! My free pattern is at http://www.squidoo.com/treegarland .